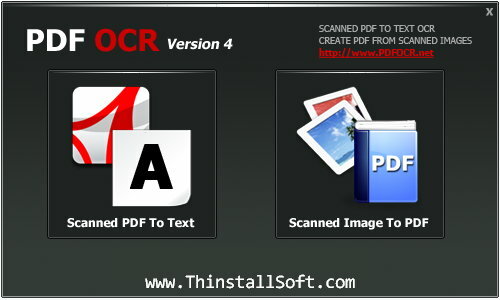 pdfOCR is a powerful PDF converter with optical character recognition ability. pdfOCR can convert image based PDF to editable text. It supports OCR English, French, German, Fraktur (Old German), Italian, Spanish, Portuguese, and Basque languages. Use pdfOCR to change scanned PDF to text. Run pdfOCRPortable.exe to launch pdfOCR Portable. The current version is pdfOCR 4.0 Free Giveaway Edition. To extract text from PDF image, you could also try Boxoft Free OCR and ABBYY Screenshot Reader. This entry was posted in Office & PDF and tagged basque ocr, english ocr, fraktur ocr, french ocr, german ocr, image to text, italian ocr, OCR, ocr freeware, pdf converter, pdf extractor, pdf ocr, PDF to Text, PDF to Txt, pdfOCR, portuguese ocr, spanish ocr. Bookmark the permalink.